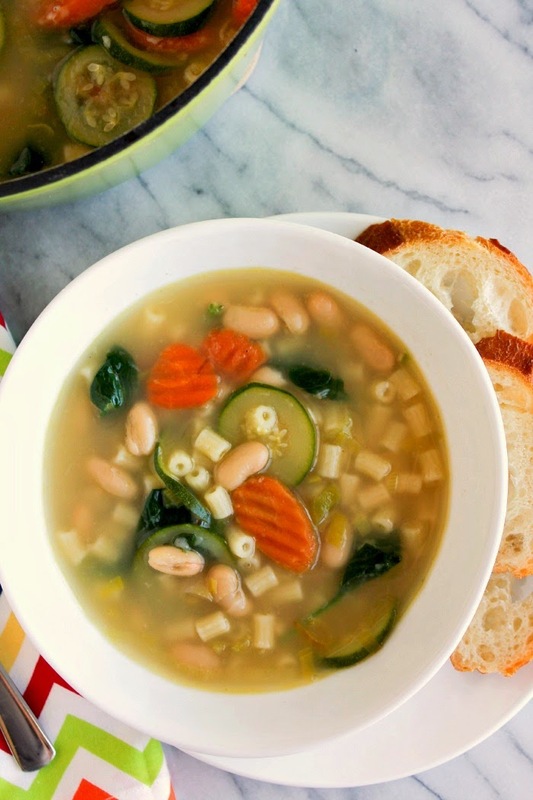 Packed with Spring veggies, beans, and pasta, this soup makes a great weeknight meal. Although the weather is getting warmer and everyone is firing up their grills, my mind has been thinking about soup. In my opinion, no matter what the weather, there isn't much that a big bowl of homemade soup doesn't cure. Got a cold? Have some soup. Have a bad breakup? Have some soup. 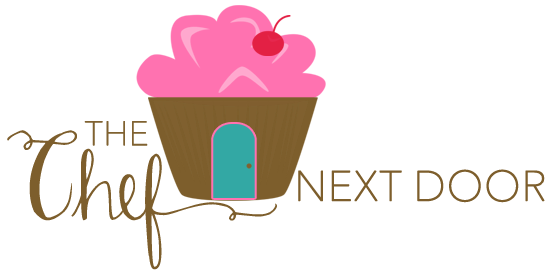 Just need a quick weeknight meal? Soup is the answer! 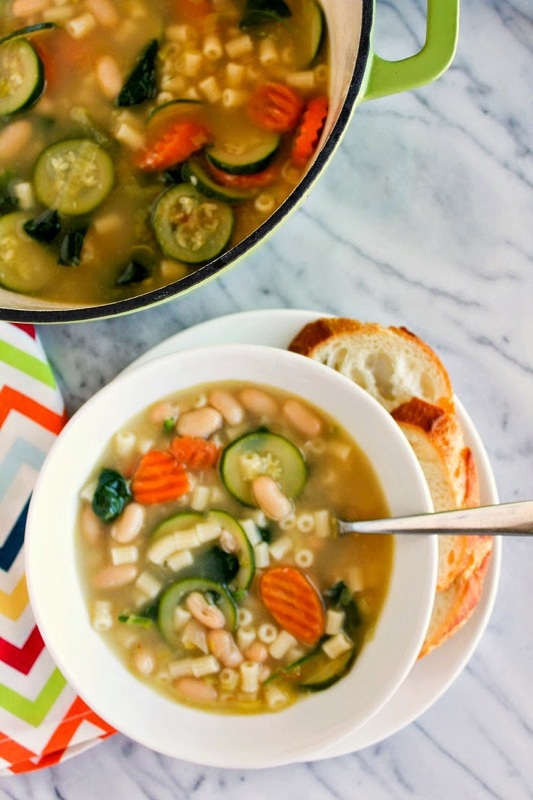 This delicious Spring Minestrone Soup is filled with my favorite fresh veggies. 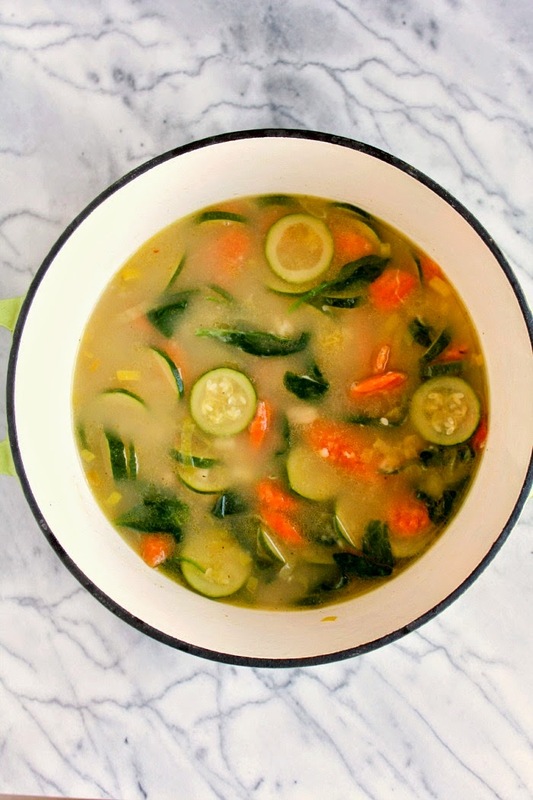 Leek, carrots, zucchini and spinach shine in this flavorful broth. The beans and pasta make it hearty, but not heavy. The soup can be made in less than 30 minutes, which makes it a perfect weeknight meal. Serve with a side of bread and dinner is served! In a Dutch oven or large pot over medium heat add the oil. Add the leek and garlic and cook, stirring often, until beginning to soften, about 5 minutes. Add the broth and water and bring to a boil. Stir in the beans, carrots, zucchini and ditalini and simmer until pasta is almost done, about 10 minutes. Add the spinach and Parmesan and cook until the spinach is wilted and Parmesan is melted. Season with salt and pepper. Ladle the soup into bowls and garnish with additional Parmesan.